CONRAD’S Restaurant & Alehouse is an everyday local neighborhood eating and drinking establishment that focuses on their made to order – scratch kitchen, craft cocktails, wine, American craft beer, with an emphasis on their local community. CONRAD’S brings great made to order food with a wide variety of chef-driven options for lunch and dinner in a scratch kitchen. We have an incredible Happy Hour that includes all forty-two taps, half-price wine and specialty craft cocktails. We feature American craft beer with an emphasis on local & regional breweries. CONRAD’S has a diverse wine list and several specialty craft cocktails on their drink menu. We open at eleven a.m. for lunch with great daily specials. The kitchen stays open until ten during the week and eleven on Friday & Saturday nights. 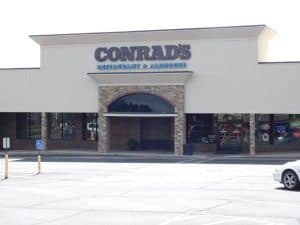 CONRAD’S Restaurant & Alehouse was founded in 2011 by Shawn Barber and Victor Barber. 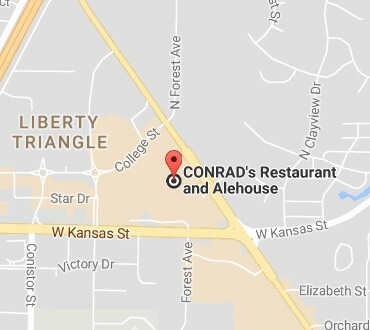 CONRAD’S Restaurant & Alehouse is part of True816 Brands that has been serving the Kansas City Northland for over eighteen years.